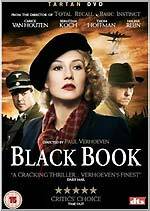 Tartan will release Paul Verhoeven's acclaimed WWII drama Black Book (Zwartboek) on DVD on April the 30th. (Few etailers have it listed as being scheduled for this date, which is a couple of weeks earlier than expected). The film, about a young Jewish singer fleeing from Nazi occupied Holland, marked the return of the director after an absence of six years. The disc will feature exclusive interviews with Verhoeven and star Carice Van Houten. The film will be presented in anamorphic widescreen format, with a choice of Dolby Digital 2.0, 5.1 and DTS 5.1 audio tracks. The RRP is £19.99. Sidney Lumet's Oscar and Golden Globe-nominated 1982 courtroom drama The Verdict will be released by Twentieth Century Fox Home Entertainment on DVD as a two-disc tin-clad Special Edition on March the 19th. It will become part of the company's Cinema Reserve imprint. The disc will feature a re-mastered version of the film, presented in anamorphic 1.85:1 format. The film is supplemented by five featurettes (Making of The Verdict (15m), Paul Newman: The Craft of Acting (9m), Sidney Lumet: The Craft of Directing (11m); Milestones in Cinema History: The Verdict (23m) and AMC Backstory: The Verdict (22m), a theatrical trailer; and a photo gallery (c.30 images). Worryingly, there's no mention of the Lumet (and, briefly, Paul Newman) commentary track that's on the current R2 version, and the US edition. The RRP is £17.99.